Thursday 28th September, saw SMMT host their annual Southern manufacturers meeting where car brands bring along a selection of their vehicles, for Journalists to test. This year it was held at Oakley Hall, near Basingstoke, and it provided a beaitufil setting to showcase many lovely cars, and pickups. The staff their were great and very helpful, with the food being very nice throughout the day. All the SMMT staff were great and one young lad was very helpful lending me a charging lead for the ever dying battery of iphones. 9am arrived and breakfast was served but more importantly, if this is possible, the time was right to start driving the cars. What a choice 50 models, from 25 brands. I rushed to get to Honda UK, but was already too late to secure the first drive of the new Civic TypeR. I spoke to Tom and Simon, and grabbed the 09.35 slot. Great. As I could not get in to the TypeR I hurried along to see Jade at Subaru to try and get the Subaru WRX STi, as I knew this would be popular. I was lucky and bagged the first drive o fthe day. Talk about wake the senses. I found that if I drove the car as it should be, I would need Wicked Reactions, extremely quickly. Excuse the artistic licence there. The car is awesome in all areas, performance, handling and looks. Thirty minutes literally flew by, as when you put your foot down in this phenominal motor you focus so intently to get the best from it. Cornering is razor sharp, with so much grip you feel completely safe and never fear the car getting out of shape. Braking matches the speed performance, allowing you to slow and stop as quickly and safely from any speed. Driving it for just a short time, I fell for it. Forget holidays, save for one of these and live life. Sadly I had to hand the keys to the Subaru back, and as I had missed my slot with the TypeR again, I headed to Land Rover and spoke to Tracey and Conrad. I got the keys to the gorgeous Range Rover Velar. Luxury and elegance personified. As you open the door you see the attention to detail with the seats and interior trim. I settled in to the superb driver's seat which envelops you like your favourite chair. I drove leisurely at first, taking in all the technology available to driver and passengers. Too many to list here, but see my longer review of the Velar on driveandride.org Reviews and News. After a short while I pushed the Velar quicker and was amazed at the performance. It has exceptional pace and reaches motorway speed limits, in around 6 seconds. Handling matches the speed, and you can take corners quickly and safely. No rolling or deviation from your line. As my allocated time neared I sadly had to return to the hotel and grab some quick photos. I hope to be able to get a loan to do a full review on film. 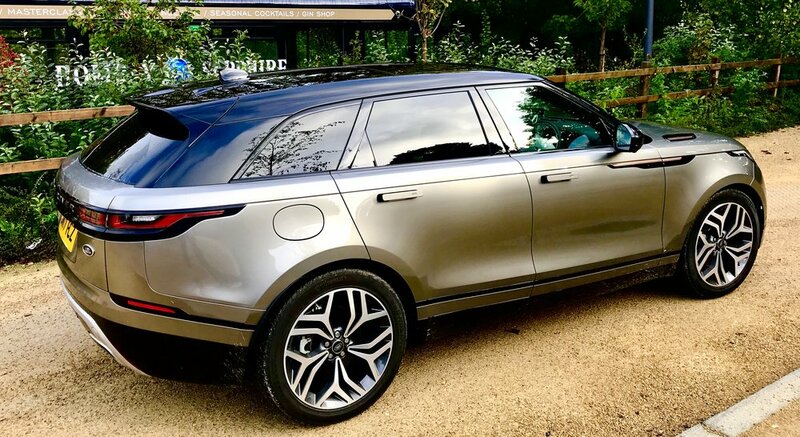 Range Rover Velar a masterclass in luxury on and offroad. Handing back the keys to the Range Rover Velar I went to the lovely ladies at Mercedes, Jane and Lucie. They got me in to the exquisite E400 4matic. This Mercedes really is magnificent with great looks and impressive performance. 9 speed automatic transmission is super smooth in both full auto or semi. Combined to the great V6 engine it can take you to 155 mph and 0-62 in 5.3 secs. It can also give you great mpg when not pushing it along at Autobahn speeds. Delivering 33.6 mpg on combined use. The model comes with a large list of technology and specifications, and it all comes together to give the driver and passengers great entertainment both from driving and all the features included. The E 400 had to go back as a long list of people were itching to drive it. I hope write a full review soon. Well after taking some photos of the Mercedes in the hotel car park, and booking more drives, lunch was served. I wont go in to details about that, and leave you with a few more photos of the cars I drove after the superb buffet. watch this space for brief reviews of these.